An oasis in the desert plains, an authentically Arab country amongst more cosmopolitan destinations, its nationals call Kuwait the bride of the Gulf. Kuwait is undoubtedly one of the most fascinating destinations in the GCC, the more intriguing because it is the land less-traveled in the region. Are you wondering what sort of things to do in Kuwait as a traveler? From beaches to museums to Souqs, Kuwait has got a lot of leisure destinations and enjoyable activities to offer. Tourism in Kuwait is actually a surprising experience full of wonders. If you are in Kuwait, or headed there soon, here are the top 5 things to do in Kuwait. The largest urban park in Kuwait, Al Shaheed Park extends over an area of almost 20 hectares. The original park was developed in the 60s as part of the city’s green belt, now it has been reconstructed to be an ecological haven in Kuwait. The park comprises two museums, a massive birds nest stands at the edge of the Habitat Museum. It also contains a Visitor’s Centre, a celebration gate and an underground car park. In the middle of the park, there is a 12000 cubic meters lake that serves more than aesthetics, it is a part of the park’s irrigation system. 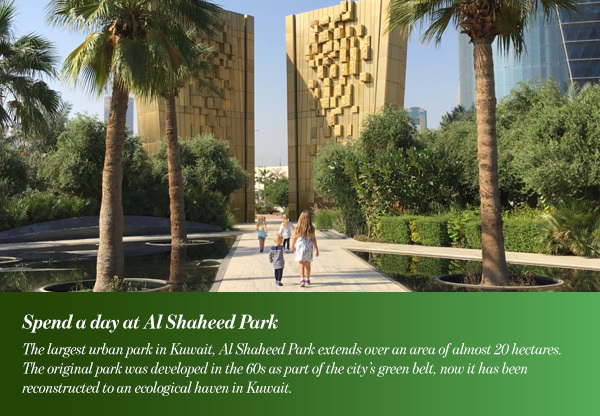 Al Shaheed Park features a walking track that spans the whole park and takes you to the museums and as it is an extensive park, it also features plenty of play areas for kids. The park also offers many restaurants and cafes. Al Shaheed Park tops our list for things to do in Kuwait because you can enjoy many things to do there. Spend a family day breathing the fresh air, walk through its museums, and have lunch or dinner in one of its restaurants as the Park is open until night. Spanning over an area of 80,000 square meters, the Scientific Center of Kuwait serves as a center for environmental education of the Arabian Gulf. 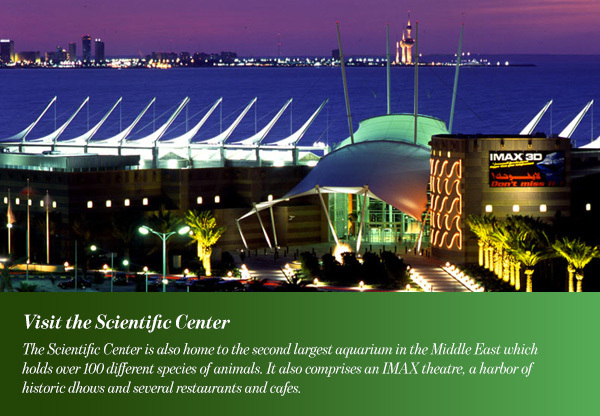 The Scientific Center is also home to the second largest aquarium in the Middle East which holds over 100 different species of animals. It also comprises an IMAX theatre, a harbor of historic dhows and several restaurants and cafes. Moreover, the center features a stunning walkway along the beach where you can enjoy the picturesque views of the coastline of Kuwait. For a complete and well-rounded experience, you can spend the whole day at the Scientific Center. You will get to learn some interesting information, have fun and relax, all at the same time. 20 km off the coast of Kuwait City in the Arabian Gulf, lies this naturally beautiful and culturally rich island. One of the top things to do in Kuwait is visiting this charming island. 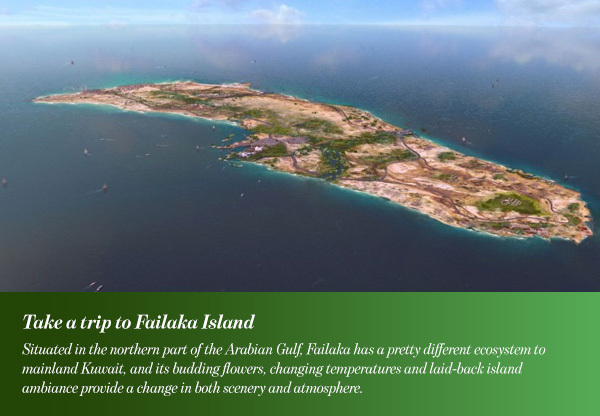 Situated in the northern part of the Arabian Gulf, Failaka has a pretty different ecosystem to mainland Kuwait, and its budding flowers, changing temperatures and laid-back island ambiance provide a change in both scenery and atmosphere. Springtime on Failaka Island is particularly spectacular. Failaka has started to develop a small authentic tourism industry; the island provides fishing, boating, swimming, sailing and water sports. Aside from the beautiful beach and marvelous weather Failaka boasts a rich history; it has been the longest continuously inhabited location in Kuwait. Mesopotamians settled in Failaka a century before the Dilmun civilization. Several civilizations which have come and gone settled on this small island ever since. A popular holiday destination in Kuwait, the ferry takes passengers to and from the island. You can find the ferry terminal in Salmiya’s Marina. Take the ferry and spend the day on this beautiful island. Or you can even spend a couple of days as there is a hotel on the island. Souq Al Mubarakeya is the oldest traditional market in Kuwait City. It has been around for more than 200 years. The old market was damaged during the Gulf War but it was renovated and restored after. Al-Mubarakiya comprises a wide variety of shops where you can find everything from Persian silk carpets, antiques, perfumes like musk and oud, and all the way to dates and spices. The market is home to two mini museums as well, Sheikh Mubarak Kiosk and the first Islamic pharmacy in Kuwait, admission is free for both. Traditional Kuwaiti cafes which brew tea over coals and several small traditional restaurants can be found in a big square in front of the old market. Featuring a spacious open-air seating area where customers can sit and relax after shopping. There is also a children playground nearby. You can spend a lovely evening strolling through the market; the shops offer the cheapest prices in Kuwait. After that, have a traditional Kuwaiti dinner and then some tea or coffee in the lovely open doors. 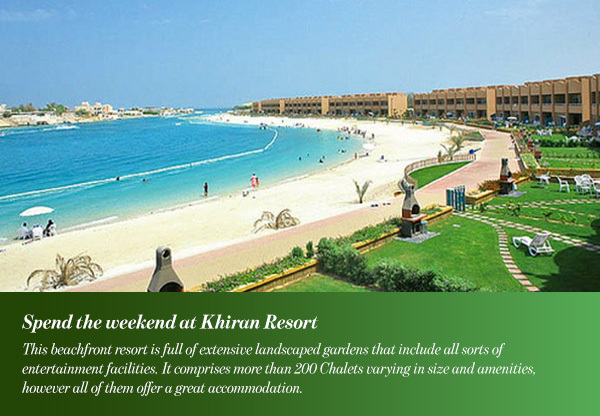 Al-Khiran Resort is around 120 kilometers away from Kuwait City in Al-Khiran District. This 831.900 square meters resort is the perfect weekend getaway in Kuwait. Although you can find many luxurious five star hotels in Kuwait, Al Khiran offers you a truly Kuwaiti experience. This luxurious resort has been around since forever. This beachfront resort is full of extensive landscaped gardens that include all sorts of entertainment facilities. It comprises more than 200 Chalets varying in size and amenities, however, all of them offer great accommodation. You can spend a lovely weekend in this seaside resort; it offers everything from restaurants to barbeque spots to swimming pools and balling alleys.